The short answer is it depends, the longer answer is, it depends on which part of the brakes need to be replaced and what make and model your car is. For example, if you need your brake pads replaced it costs on average £160 (it could be less or more depending on the car). If the brake replacement goes beyond this then the costs are different again. Costs to replace brakes also depends on which garage you go to and how much they charge for their time to work on the car. That’s why it’s always good to compare the market for brake repair costs with MyCarNeedsA.com you can do this online with just the click of a button. No calling around for prices from garages in your area, we do all that for you and email them directly to you. 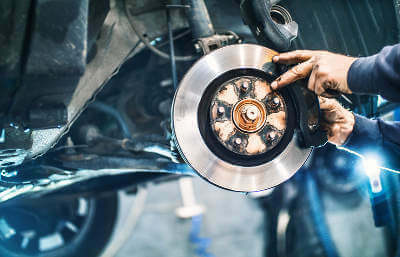 Your Brakes are the most important element to your car, for obvious reasons, so naturally, at MyCarNeedsA.com, we want to look out for your safety when it comes to brake repairs. That’s why we check and approve all garages before they can provide a quote for your brakes online. You can also read previous customer reviews and choose the best garage in your area. How often should brakes be checked? Brakes are crucial and checking them should be part of your routine. When checking over your car look out for any rust or visible damage, if something doesn’t look right get it checked. If you hear any screeches or the sound of metal touching metal then your brakes will need to be replaced immediately. If your car is booked in for regular services, most garages will carry out a VHC (Vehicle Health Check) from here the mechanic will advise if your car needs any attention within the next few months. This usually includes a check on your brake pads and discs , tyres, oil, essential fluids and lights. The vehicle health check report is usually emailed or discussed with the car owner and if your car needs anything important urgently it will be flagged red, amber for not urgent but will need attention and green for a pass. There are so many different elements to car brakes, which makes it difficult to give an exact cost for brake repairs. There are brake pads, discs , cylinder, hoses, pistons and many more elements that can affect your brakes. 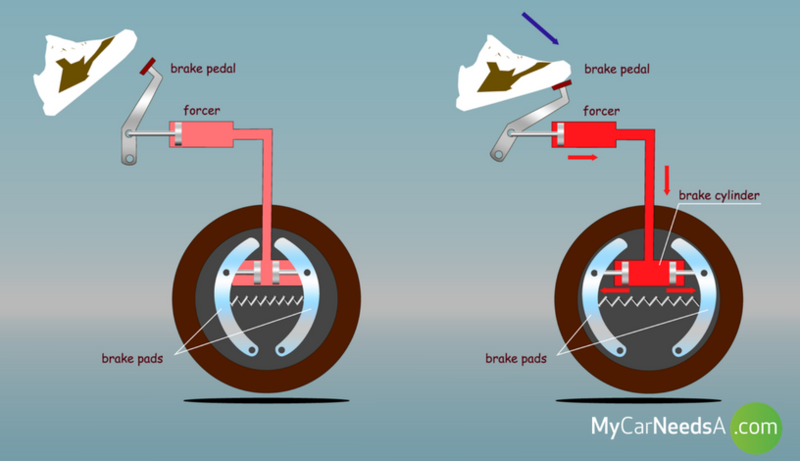 Take a look at the diagram below showing you the basics of applying your brakes and what that looks like internally. Get quotes for your brake replacement today. The short answer is, it depends on your driving style. The longer answer is, are you driving on motorways or city/town streets. If you are driving motorway miles then it’s likely that your brakes could last anywhere from 45,000-55,000 miles however if your miles are done in city or town centre miles, they can last anywhere from 25-45,000 miles. In city centre driving brakes are used more, there is more stopping and starting, therefore, the brake pads will be put to the test. If your brakes feel spongy or when you are applying the brakes, something doesn’t feel right, you can get quotes for your brake repairs at MyCarNeedsA.com . With over 4,000 garages on our website, you can expect to get quotes from fast fit chains, dealerships and family run garages in your area. Then you choose the option that suits you best.